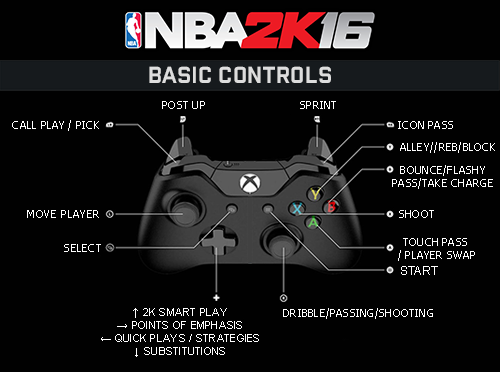 Below are all the basic and advanced NBA 2K16 controls for Xbox and PlayStation gamepad controllers, revealed by the Microsoft SmartGlass app. Putback Dunk/Layup:Move & hold the shot stick in any direction during an offensive rebound. Euro Step Layup: Move and hold the shot stick away from hoop left/right (while driving) toward hoop. Fast Shuffle: Press & hold L2/LT or R2/RT & move the left stick in any direction. Advanced Pick Control: Press and hold L1/LB. Use R1/RB to choose Roll vs. Fade and R1/RB to choose pick side.